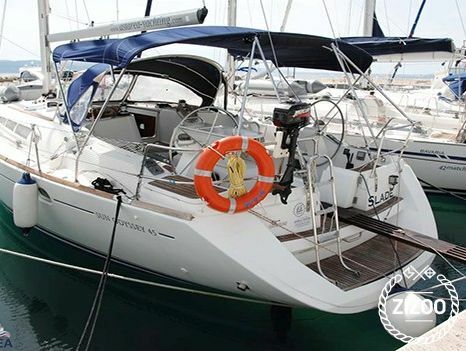 To the west of Makarska, in Baska Voda, is the 2005 Jeanneau Sun Odyssey 45, named Slade. With 4 cabins, 2 extra berths in the salon, and 2 bathrooms, this spacious sailboat ensures exceptional stability and comfort at sea. Explore the Adriatic with a group of your closest friends, or talk your boss into organizing a week of team-building at the sea. Grip the ropes and haul the sails, run from one side to the other as you try to balance on the waves, anchor at a secluded bay and compete in who creates the biggest splash as you dive into one of the cleanest seas in the world. Round up your crew and gather round the charts as you plot your routes and discuss strategy. Bond over Dalmatian figs and wine, or head out and check out the island nightlife. For more information on the Slade don't hesitate to contact your crew.